GMS-2000 is multi-channel digital controller to monitor gas leakages from more than one gas detectors simultaneously. GMS-2000 is composed of one alarming unit & more than one receiving units. While each receiving units in GMS-2000 receive density signals from external gas detectors, when the density becomes higher than alarm value, receiving units automatically give signal to alarming unit to sound alarm. GMS-2000 transmits the relay output and standard current output signal 4-20㎃ to various controllers such as PLC, DDC, recorders, and computers for composition of integrated gas monitoring system. Centralized gas monitoring is available by connection with more than one gas detectors. 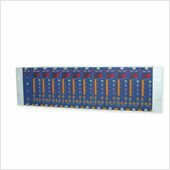 Receiving 4-20㎃ analogue continuous signals from more than one gas detectors simultaneously and displaying the digital signals accurately by built-in high resolution A/D converter. User programming alarm range, alarm delay time, and so on, by built-in micro processor. Bar graph displays the alarming density for maximum visual effect. Built-in high resolution D/A converter for accurate transmission of 4-20㎃ standard current output signal to external controllers (PLC/DDC). High/low relay output for interlocking with external devices such as fan. Robust aluminum alloy casing & frame. Alarm density HIGH/LOW 2 step Alarm density –set by user.